With this Special Health Report, Living Better, Living Longer, you will learn the protective steps doctors recommend for keeping your mind and body fit for an active and rewarding life. You’ll get tips for diet and exercise, preventive screenings, reducing the risk of coronary disease, strengthening bones, lessening joint aches, and assuring that your sight, hearing, and memory all stay sharp. Plus, you’ll get authoritative guidance to help you stretch your health care dollar, select a health plan that meets your needs, prepare a health care proxy, and more. Now that your time is your own, make the most of it! A comprehensive new health, wellness, and planning guide from Harvard Medical School will show you how. Living Better, Living Longer details the smart steps seniors can—and should—take now to keep the golden years shining brightly. It is filled with practical tips and guidance for protecting your coming years from those problems that can derail a full and rewarding seniority. Key to doing all the things you want to do is good health. 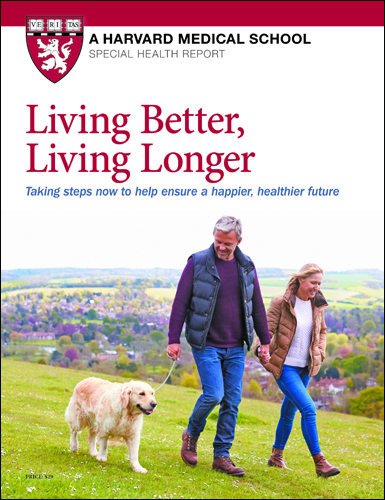 In Living Better, Living Longer Harvard doctors share the latest findings about those lifestyle choices and preventive screenings that can make a measureable and positive contribution to your future health and longevity. You’ll discover how you can incorporate exercise and wholesome eating into your life without sweat or sacrifice. You’ll learn how to banish boredom from your workouts and add spice to your diet with delicious foods that expand your palate while slimming your waist. Importantly, the report will give you new ways to challenge your mind and memory to strengthen their agility and resiliency. You’ll be briefed on what you can do to assure that your vision and hearing stay in peak condition. You’ll get tips for improving sleep and lessening stress. And the doctors will give you targeted strategies for keeping your joints pain-free and your bones strong. Living Better, Living Longer will also add to your peace-of-mind when it comes to making the right choices for health insurance, long-term care, advance directives, and more. The report deciphers the often-confusing options in Medicare and Medigap coverage, the costs and benefits of long-term care policies, and points to consider before drafting a living will or health care proxy. And the report weighs the pros and cons of retirement communities, assisted living facilities, staying your own home, or downsizing to a new house. Enjoy the tomorrows you’ve waited for. Order your copy of Living Better, Living Longer today! Medical Director, Healthy Living Center of Excellence Clinical Instructor of Medicine, 50 pages (2017). Planning ahead: What’s important to you? Can I take a pill for that? Odds are good that you’ll stay independent well into later life if you take care of yourself. But it’s hard to know with certainty what the future will bring for anyone. The time to start planning for contingencies is now. If you’re a healthy person in your 50s or early 60s, that may sound like odd advice. But it’s good to know about options that can help before you need to seek them out for yourself or a loved one. Hurried decisions made on the heels of an emergency such as a broken hip, stroke, or heart attack may not suit you as well as those carefully considered in advance. You needn’t have a crystal ball to make certain predictions—and changes—that will help you live a long, independent life. Here are some steps that are likely to be helpful no matter what your circumstances. Adapt your home. Walk through your home with the “Home safety checklist” (see page 49) in hand to help decide on necessary updates. Stairs, baths, and kitchens present obstacles for older people. You may not need to make any changes now, but it’s a good idea to do an annual inventory, so you can make updates as your needs change. Prevent falls. Fractures often follow falls, and disability, health complications, or even death may follow fractures. The exercises in “Reducing your risk of falls” (at right) can help keep you upright. Look into NORCs. One way to make living at home safer and more comfortable with age is to link up with a naturally occurring retirement community (NORC). These neighborhoods and housing complexes aren’t developed specifically to serve seniors—and, in fact, tend to host a mix of ages—but because they have a range of coordinated care and support available, they are senior-friendly. The Jewish Federations of North America launched a National NORCs Aging In Place Initiative and have helped secure grants to fund projects in 45 communities in 26 states. One example, the nonprofit Beacon Hill Village in Boston, offers an unusually broad variety of helpful options, ranging from grocery shopping and home repairs to preventive health care and home health aides, all for a yearly membership fee plus discounted fees per service. Many other communities—Chicago, Minneapolis, Los Angeles, and Washington, D.C., among them—have received grants from the U.S. Administration on Aging to fund local NORCs. Your local Agency on Aging may have information on what is available in your area. Think ahead about getting assistance. Identify your most likely needs during the coming years with your doctor, who may be able to suggest local services. The Eldercare Locator can also assist you (see “Resources,” page 52). Family and friends may be willing to help meet certain needs or have helpful solutions (see “What if you don’t want to move?” on page 48). Shopping for groceries and other essentials can be accomplished over the phone and via the Inter- net, for example. Meal preparation, transportation, home repair, housecleaning, and help with financial tasks such as paying bills might be hired out if you can afford it, shared among friends and family, or obtained through elder services offered in your community or through long-term care insurance. Plan for emergencies. Who might check in on you regularly? Whom can you call in an emergency? What would happen if you fell and couldn’t reach the phone? Keep emergency numbers near each phone or on speed dial. Carry a cellphone (preferably with large buttons and bright screens), or consider investing in a Lifeline, LifeFone, Life Station, or another type of personal alarm system. These devices can be worn on the wrist like a watch, around the neck like a pendant, or clipped to a belt buckle. When you push the button, it signals a base unit connected to your phone, which dials a monitoring center; operators there will talk to you through a two-way speaker in the base unit or the pendant to find out the nature of the emergency, then dispatch paramedics and call your family members, even if you don’t respond. Another option is looking into companionship services or phone checks from a local religious group or Agency on Aging (to find one, check with the Eldercare Locator; see “Resources,” page 52). Write advance care directives. Advance care directives, such as a living will, durable power of attorney for health care, or health care proxy, allow you to explain the type of medical care you want if you’re too sick, confused, or injured to voice your wishes. Every adult should have these documents.